Members of the Evergreen Indiana Library Consortium will operate under uniform circulation policies and procedures. This is a condition of participation in the consortium pursuant to the Evergreen Indiana Membership Agreement and the Evergreen Indiana Executive Committee. The vision of the Evergreen Indiana Library Consortium includes as a fundamental tenet the ability of library patrons to see and borrow library materials from all participating Evergreen Indiana Libraries. This goal of maximum access for patrons is tempered by the nature of the materials themselves and the logistics of moving materials among the libraries. Member libraries have agreed that Evergreen Indiana membership will not relieve libraries of the responsibility for purchasing the materials needed to meet the demands of local patrons. The Evergreen Indiana Circulation Policy is implemented by the Evergreen Indiana Circulation Procedures. The Evergreen Indiana Circulation Policy and the Evergreen Indiana Circulation Procedures represent the decisions of the Executive Committee. Some policies and procedures may remain under local control, varying with the specific situation of each library, library district or library system. Patrons of Indiana public libraries not participating in the Evergreen Indiana Consortium may receive a library card at an Evergreen Indiana library pursuant to reciprocal borrower and other agreements. Users from non-participating Indiana libraries will not have the same privileges as Evergreen Indiana patrons and such cards may be suspended at any time without notice. 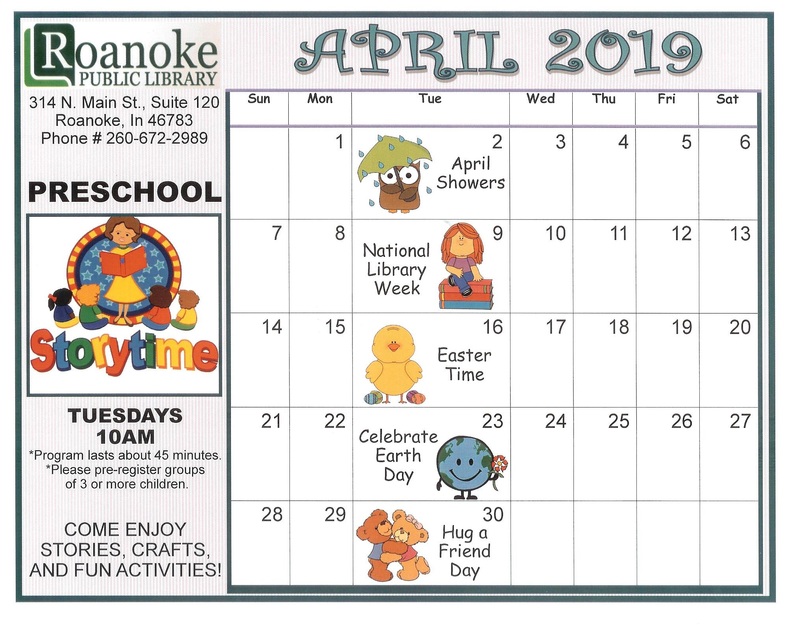 This includes Student cards issued by the Roanoke Public Library to Roanoke Elementary School students. Residents of Indiana presenting Proper Identification (see below for definition of “Proper Identification”) that establishes that the individual resides in or pays real property taxes on property owned in the library’s service area (the “library district”) are eligible to receive an Evergreen Indiana “resident” library card. 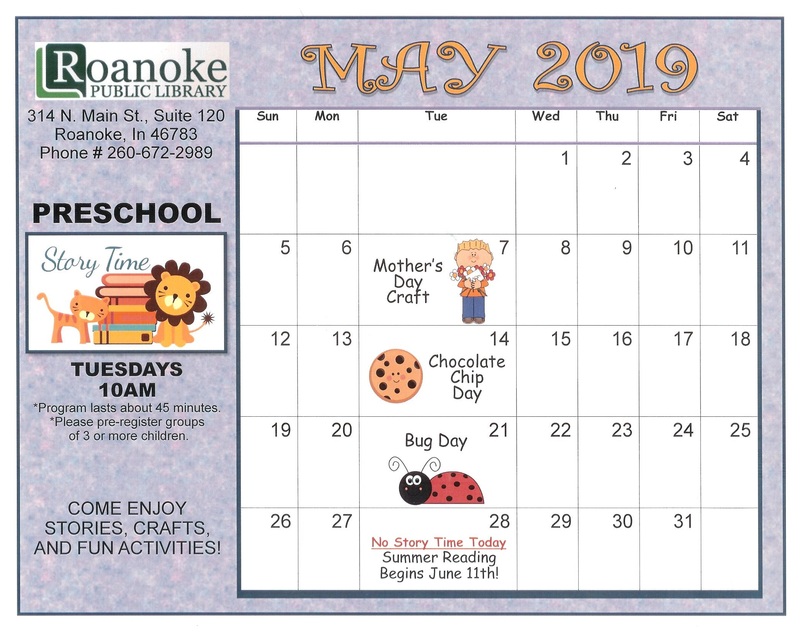 Patrons living in the Roanoke city limits may have an Evergreen Indiana library card for each family member living in the household who use the library at no cost. Once received, cards are valid for two years and then must be renewed. Persons who own real or personal property located within the Roanoke Public Library district upon which they pay Library property tax are entitled to receive an Evergreen Indiana Library card at no cost for each family member living in the household upon presentation of proof of paying property tax to support the Roanoke Public Library. This includes businesses located within the town of Roanoke. Indiana residents not residing in a library district may be eligible to purchase or otherwise obtain an Evergreen Indiana Library card as a non-resident, PLAC, reciprocal borrower or township contract user subject to the laws and regulations covering these types of cards. Non-resident cards and PLAC cards are issued to those individuals residing outside the library district who purchase library cards with full access to library materials and services. All other card holders, temporary, student, computer usage and reciprocal borrower cards are given limited access to services and materials. Persons living outside the city limits and who do not pay property tax may purchase a non-resident library card. The cost will be the annual per capita rate as determined by the Library Board. Residents or non-residents holding a Roanoke Library card may purchase a PLAC (Public Library Access Card) which shall provide access to all public libraries in the state of Indiana. Cost of the card is determined by the Indiana Library and Historical Board on an annual basis. Applicants for an Evergreen Indiana library card must present the required Proper Identification in person at the Evergreen Indiana library that will issue the library card (see below for definition of “Proper Identification”). Property owners who do not reside in Indiana will be required to show proof of real property ownership, such as a tax bill or deed. Signing an Evergreen Indiana library card denotes acceptance of responsibility for all fines and fees and for payment for lost or damaged materials. Patrons are advised to contact their library to report a lost or stolen library card. Registering a minor child for an Evergreen Indiana library card denotes an acknowledgement and understanding that Evergreen Indiana libraries own and circulate videos, DVDs and unrated television series that may be geared toward a more mature audience and that a minor child will have access to materials for both adults and children and will be able to check out any of these materials. A parent or guardian may request a “limited access” card which prevents the user from checking out “R-rated” audio-visual materials. a current government issued photo ID. If the presented Proper Identification does not display a current address, the applicant must present one item from the accepted proof of residency documents in addition to the Indiana Driver’s License, Indiana State ID or other government issued photo ID presented as Proper Identification. The ID presented from the Approved List must include a current address. Patrons changing their home library designations will be asked to provide identification and proof of current address. Proof of current address may be satisfied by the presentation of Proper Identification and if necessary, one item from the Approved List of ID which displays a current address. Individuals who reside in an area where no library tax is levied to support a public library may apply for a nonresident card. Nonresident cards are available for a fee and expire one year from date of issue. Nonresident borrowers enjoy full privileges of the Evergreen Indiana Consortium. The Public Library Access Card (PLAC) is the name for the statewide library card. The PLAC program allows an individual to borrow materials directly from any public library in Indiana. An individual who holds a valid public library card may obtain a PLAC. Public Library Access Cards are available for a fee as determined by Indiana Code (Indiana Code 4-23-7.1- 5.10) and expire one year from date of issue. The Roanoke Public Library does not have any reciprocal borrower agreements. A patron must present a card in good standing to borrow materials. In most cases, a maximum of 100 items may be charged simultaneously on an Evergreen Indiana library card. There is a maximum limit of 10 DVDs, 10 videos, 6 art and 3 gaming software items per Evergreen Indiana library card. The 100 item, 10 DVDs, 10 videos, 6 art and 1 gaming software limits are calculated at the consortium level and not at the library level. Home patrons of the Roanoke Public Library may use a valid Indiana driver’s license or Indiana State issued id in lieu of a library card at this location only. Librarians are trained to group materials according to the appropriate age group and reading level. Every effort is made to place materials in the appropriate collection. However, parents should understand that books and other materials from the adult and the young adult collections are readily available to children. Many of these materials contain mature language, images, and themes or depict adult situations. AS A RESULT, THE LIBRARY MAINTAINS THAT IT IS THE SOLE RESPONSIBILITY OF PARENTS, GUARDIANS, OR CARE GIVERS TO MONITOR WHAT CONTENT AND/OR MATERIALS THEIR CHILDREN ACCESS OR BORROW FROM THE LIBRARY. As such, library staff will not prohibit minors from accessing or borrowing such materials. Note: we do prohibit children under 18 from borrowing R-rated movies, unless parent or guardian gives specific permission for such item to be checked out to the child at the time of the check-out. A patron’s access to materials may be limited due to overdue materials or fines and fees. A patron’s card will be blocked, and no services may be obtained with it if the patron has 15 or more overdue items, or owes $10 or more in unpaid fines and/or fees. Outreach patrons will not be blocked until they have 50 or more items overdue. The number of overdue materials and/or amount of fines/fees that will result in a patron being “blocked” is calculated at the consortium level and not at the library level. A patron may also be “barred” if circumstances warrant. Reference materials, local history materials, newspapers, microfilms, and vintage books do not circulate. Renewal requests may be made in person, online, by phone or via text message. Patrons may also renew their items via the OPAC “My Account” feature. Most item types have a maximum renewal of one (1) renewal. Books from the general collection have a maximum renewal of two (2) renewals. Library drop boxes are emptied at 9:00 am each business day. There is no overdue charge on items left in drop boxes before 9:00 am of the next business day after the due date printed on the checkout receipt. Patrons who provide an email address will receive an email notice three days before their materials are due and an email notice on the day their materials are due. The library will attempt to call patrons when their items are overdue as a courtesy. Evergreen Indiana library fines and fees shall be paid at the billing library. Patrons may pay all or a portion of overdue fines. A patron’s record will remain blocked or barred until the fines and fees are paid or the patron has resolved the matter with the particular library to restore his or her privileges. A patron may be (or remain) “blocked” if related group or family member cards are “blocked”. Library materials are expected to be returned in reasonably the same condition as when they left. Patrons are urged to exercise reasonable care in using library materials. Patrons are fully responsible for any damage or loss of materials checked out to them. Once a damaged item is paid for, the patron may elect to keep the item. It is the responsibility of Library Staff to decide if the damage was caused by the patron or just normal wear. If it is determined that the damage was caused by the patron the patron will be assessed for the damage. Patrons will not be charged for damage to materials sustained as a result of normal usage and when reasonable care was exercised when utilizing library materials. It is the responsibility of Library Staff to decide if the damage was caused by the patron misuse or just normal wear. If it is determined that the damage was caused by the patron’s misuse, the patron will be assessed for the damage. Overdue items will be considered “LOST” if not returned within 45 days of the due date. A patron may inform library staff that an item is “LOST” before it reached the 45th day overdue. The price of the item will be assessed to the patron’s card. Other Evergreen Indiana libraries may assess up to $10.00 per item processing fee for the replacement of lost or damaged materials. A patron may inform library staff that an item is “LOST.” The price of the item and any outstanding fines and fees will be assessed to the patron’s card. A patron is encouraged to notify the library that an item is “LOST” to stop the accruing of additional overdue fines. Patrons do have the option of replacing lost or damaged items through independent purchase, as long as the item is in the same or better condition than the item was when checked out. Patrons who have repeated (3 or more) claims returned/claims never checked out, will have to sign the transit slip upon checking out any further items owned by Libraries other than Roanoke Public Library. These signed transit slips will be kept until the item is returned to be shipped back to its owning library. These signed slips will be used as proof that the item was received by the patron and patron will be assessed the full value of the item and any fines/fees the owning library assesses if the item is not returned when due. All assessed fines/fees collected will be forwarded to the owning library. Holds may be placed on most items in any Evergreen Indiana library (see list of exceptions below). Patrons will have one week after the hold is filled to pick up the held item. Some Evergreen Indiana libraries may impose a fee for failure to pick up a hold. Although holds may not be placed on the above materials by a non-local patron, these items may be borrowed by any Evergreen Indiana library card holder. It is the responsibility of the patron to proceed to the owning library and check out the material. The patron may return such materials to any Evergreen Indiana library for transit to the owning library. In addition, a library may place a six-month age protection for new items. This means that no holds that would generate Intra-Evergreen Indiana loans may be placed on new items until the owning library has held such item in its collection for six months. Local patrons may place holds on such items. A three-month hold protection is also available for less popular items. Library patrons will be given a PIN upon registering for an Evergreen Indiana library card. Evergreen Indiana policy indicates that PINs may only be given in person at an Evergreen Indiana Library, upon presentation of appropriate identification. PINs may not be obtained via telephone or email. At their first use of the My Account feature of the OPAC, patrons will be prompted to change the PIN to a minimum 7- character password. Patrons may also choose to select a user name to use in place of the library card barcode when accessing My Account. User names must be unique within the Evergreen Indiana system. Patrons may change user name, password, and email address with My Account at any time. It is the responsibility of the Roanoke Public Library to maintain a healthy and clean environment for all Library users and to protect the community’s investment in Library collections, equipment and property. In order to fulfill this responsibility, the Library may restrict a user’s ability to borrow materials and/or to visit Library facilities when such use may jeopardize the health and cleanliness of Library facilities, collections and users. Should it become necessary to suspend Library privileges of a patron in order to protect Library collections, facilities or other users, notification of the suspension will be made by the director or director’s designee. Access to facilities and borrowing will be restored when the suspended patron demonstrates that the situation that caused the loss of privileges has been remediated. Any patron who has privileges suspended under the terms of this policy may request a re-evaluation of the suspension. It's Monday 6:55 PM — Closing in 5 minutes . Come visit us.